Kwesi Brew was one of the finest Ghanaian poets of his generation. 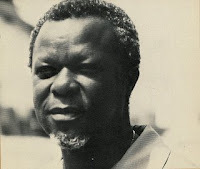 He left a permanent mark on the landscape of Ghanaian poetry, and on the country itself - it is sometimes suggested that "The Sea Eats Our Lands" played a role in motivating the government to construct Keta's sea-defense system. He died in 2007, at the age of 79. In 2008 we concluded our Keta Series with Brew's "The Sea Eats Our Lands". It seemed only fitting to conclude our Harmattan Series with another Brew classic. I was a young & incompetent volunteer teacher in Senegal in the 60s, when Kwesi Brew was ambassador of Ghana in Dakar. He regaled us young brits with whisky & the Beatles, & read us his poems. I remember him as generous, unpatronising, expansive and above all creative, far happier as a poet than a diplomat.